Some folks say you can catch as many catfish during the day as you can at night. Maybe some folks do, but not me. My best catch ever came on a moonless summer night while fishing from a big-river sandbar. In six hours, a friend and I caught more than 150 catfish – mostly channel cats, a few blues and flatheads, several over 20 pounds. I’ve had 100-cat nights more times than I can remember. Only rarely have I had 100-cat days. 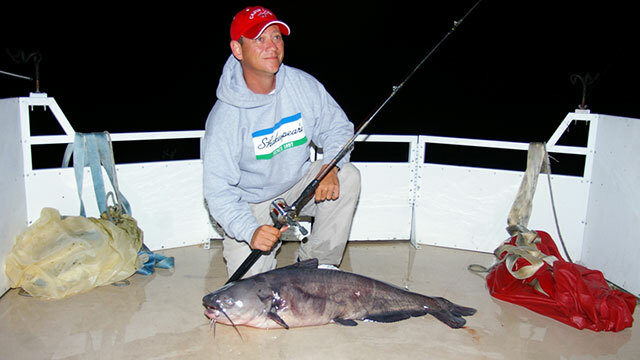 Night fishing is better largely because summer catfish move from deeper water to shallows to feed at night, making them easier to find and catch. Whiskerfish and their prey are more comfortable in shallow, near-shore environs when the sun is down. Thus you can fish near shore and know you’re “in the zone.” You need not spend valuable time trying to pinpoint your quarry in the vast off-shore reaches of a lake or river, thus your catch rate soars. If you’re sold on that premise, let me ask something. Is your goal to catch a trophy catfish that will test your moxie and your tackle? Or would you be more satisfied catching a mess of small cats you can take home and eat? Big cats or small? The way you fish should be determined by your answer. I delight in catching big heavyweight catfish, but I don’t always enjoy fishing for them. You see, trophy catfishing can be boring. Big catfish are much less common than smaller cats, so many hours may pass while trying to catch one. Patience wears thin. The lack of action can be excruciating. To shorten your waiting time, use the proper big-fish tactics. First, be sure you’re fishing the right body of water. When it comes to trophy catfishing, not all are created equal. Study online resources or contact your state fisheries agency to determine the most productive rivers and lakes. Focus your efforts where there’s likely to be a pay-off. Keep bait in the water where the big ones swim. You also should invest in top-quality tackle. An angler using too light or poorly made gear may see his rod or line snapped or have a reel turned into a hunk of inoperable metal and graphite. Most ardent trophy anglers favor medium-heavy to heavy, fast-action, 7- to 10-foot rods with long, reinforced fighting butts and blank-through-handle construction. Baitcasting reels are more durable than spinning and spincast reels and provide more fish-cranking power. Look for a solid frame, tough gears and first-rate drag system, plus adequate line capacity (at least 200 yards of 17- to 20-pound-test). The best have a “clicker” mechanism that produces an audible bite signal and spool tension for backlash prevention. You’ll want heavy-gauge hooks, too – needle-sharp and of a size adequate to properly handle the baits you’ll use – and quality, abrasion-resistant fishing line rated for the size fish you hope to catch. Oily baitfish such as shad, herrings and suckers are tops. Others to try include carp, chubs, goldeyes and sunfish. Always use live fish for big flatheads; they rarely eat anything else. Jumbo blues and channels will eat fish alive or dead, including cut-baits prepared by slicing fresh baitfish into chunks or fillets. Be sure, however, the baits are freshly caught. Fresh is best. When you finally land a heavyweight catfish, you can take pride in the fact you’ve triumphed over one of freshwater fishing’s finest trophies. Catch your second, third and fourth trophy-class cat, and you enter a fraternity of elite anglers. Only a handful of fishermen catch big ones consistently. That’s a goal worth shooting for. Catching frying-pan catfish is vastly different than trophy fishing. Patience and persistence rarely are required because eating-size cats are abundant in many waters, including ponds, small streams and urban lakes. Baits can be bought in a grocery or discount store, and using expensive, top-quality tackle isn’t a prerequisite. Fishing for eating-size cats is more hassle-free than pursuing trophies, and rarely boring. A medium spinning or spincast outfit is ideal for this type of fishing. I spool mine with 6- to 10-pound-test monofilament. The other tackle you’ll need can be carried in a small tackle box: a few hooks and sinkers, some extra line, a stringer and pliers for removing hooks from the catfish’s tough mouth. Eating-size whiskers aren’t finicky about food. Buy some worms, crawfish or minnows at the bait shop, or pick up some fresh chicken liver, hot dogs, bacon, cheese or shrimp at the supermarket. Small pieces of the latter five work well on bullheads, channel cats and small blues and flatheads. Commercial dip baits and doughbaits also make great enticements. Fish on bottom, using a split shot or small slip sinker to dunk your bait. Don’t get antsy; let the bait sit several minutes before moving it. Like kids after fresh-baked pie, cats smell their treats, then track them down. While you’re waiting, listen to the hoot owls and whip-poor-wills. Enjoy the lightning-bug light show. Breathe the fresh air. Delight in some small talk with your fishing companions. When a catfish bites, bring it in. Play it slow. Savor the moment. If it’s a trophy catfish, snap a photo and release the fish for someone else to catch. If it’s an eating-size cat, put it on a stringer and take it home for dinner. Big cats or small, lots of fish or few – it doesn’t really matter. We catfish for reasons that have nothing to do with numbers. We catfish because, fish or not, being out there brings us a joy.